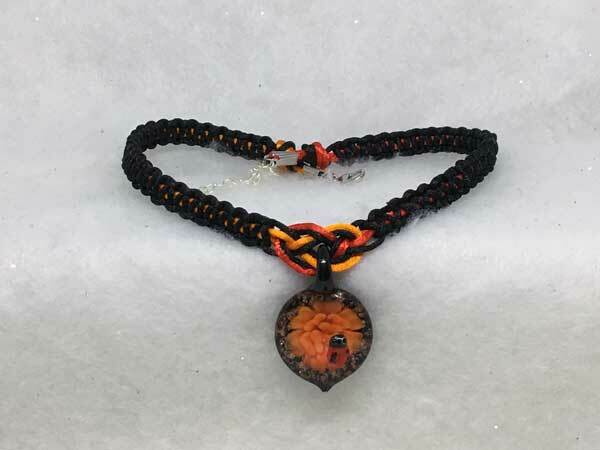 This piece is made with waxed cord in combination with satinique cord in black, red and orange. The length can vary from about 16 to 19 inches with a center jeweled piece that adds 1 1/2 inches. The necklace needed nothing more than the gorgeous lampwork glass pendant! The pendant has a black background with rose gold glitter. The forefront design is a beautiful orange flower. The ladybug is three-dimensional and sits on the outside of the flower pendant.